Renault have finally launched their Small SUV offering. 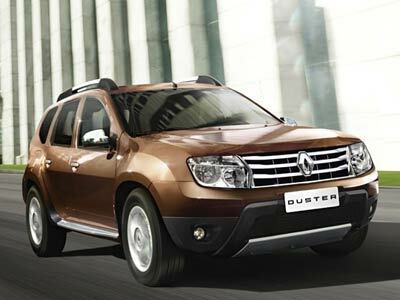 The Duster comes either as the base model 1.6 Expression 4×2 priced at R194,900 with a 16valve 1.6 petrol engine producing 75kW and 145Nm or a 4×4 1.5d Ci turbo diesel. Standard features include air conditioning, ABS with EBD, power-assisted steering, six-function on-board computer, front and side airbags, electric windows front and rear, electric mirrors, remote central locking, reverse parking sensors, front fog lamps, roof rails, body-coloured door handles and mirrors, 16 inch wheels, CD/MP3/radio with Bluetooth® connectivity, fingertip audio controls . The diesel has a common rail 1,600 bar pressure coupled with piezoelectric injectors, the 1.5 dCi delivers an excellent power output of 80kW with peak torque rating of 240Nm attained at 1 750 rpm on the 4×4 and 2 250 rpm on the 4×2. The upper trim Dynamique is offered with both 1.6 16v petrol engine and 1.5 dCi turbo diesel engine, the latter giving the choice of 4×2 or 4×4 transmission. The gear ratio setting of the manual 6-speed gearbox, specific to the 4×4 version, also plays a crucial part with a short first gear (5.79 km/h at 1 000 r/min) allowing one to negotiate even the most extreme off-road conditions, traversing steep, carrying heavy loads or towing, without damaging or possibly burning the clutch. A perfect fit with the 1.5 dCi which low-end torque ensures steady response in all situations. The New Renault Duster 1.5 dCi Dynamique 4×4 is equipped with ESP (Electronic Stability Program) and a high-performing 4WD control system, derived from Nissan (in the frame of the Renault-Nissan Alliance). Late August into September is the perfect time to go and look at the West Coast’s Namaqualand daisy explosion of spring flowers. Carpets of purples, yellows, oranges, from white to red and everything in-between. They open on sunny days which are above 17°C but are great even on cooler slightly overcast days. The whole area from Durbanville right up to the Orange river becomes a riot of colour. There are plenty of places to stay, from rustic B&B’s to grand lodges. 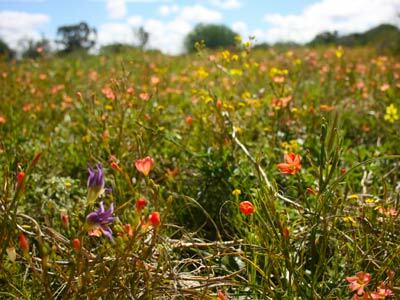 Go to http://www.sa-venues.com/attractionsnc/namaqualand-flower-route.htm . One of the secret places where the greatest variety blossom is the Pakhuis Pass, northern Cedarberg area. 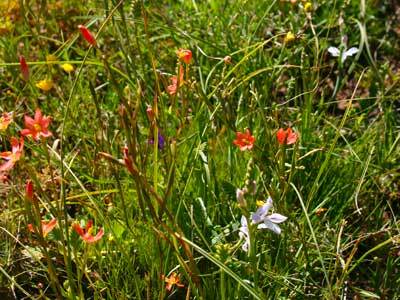 In this area fynbos, vygies and the daisies mix it up in a glorious display. A great place to base yourself is Travellers Rest on the Wupperthal or Eastern side of the pass. This is one of my favourite hideaways. Accommodation is simple but good and it is quiet. The houses are clean, the showers are hot, and all you need to bring is your food. There is a little shop and cafe at reception. The units are far apart. Website is: http://www.travellersrest.co.za/. An added plus, apart from the flowers, is the 11 cave bushmen’s painting hiking route. To get there turn off the N7 at Clanwilliam and head east over the Pakhuis Pass. It is on your right where the road crosses the Brandewyn river about 5km from the pass. Every year Clanwilliam puts together a spring flower show in their old church hall. This is worth visiting as well. They group flowers from the different regions. Sandveld flowers in a display, coastal flowers, karoo succulents, mountain flora and so on. Clanwilliam is an easy two-and-a-half hour drive from Cape Town. There are three restaurants at the top of the Piekenier’s pass before you descend into the Olifants river valley. Well worth a stop for a snack but also to check out their farm stalls. Do yourself a favour. Go and look at one of the natural wonders of the world. The carpets of flowers will lift your soul. The Wrangler is an off-road machine. I use the Helderberg Farm 4×4 trail to test 4×4 vehicles. Well, the Wrangler just wasn’t tested. It is so capable it just waltzed over the course. It is almost foolproof off-roading at its best. But loads of fun. The Jeep Wrangler really can go anywhere, even to the ends of the earth. 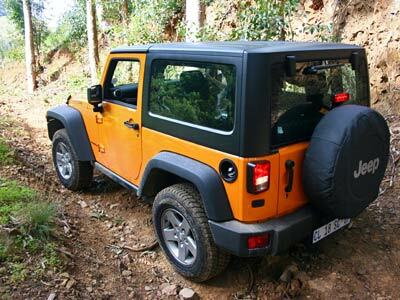 The wrangler we tested is the short wheelbase two door Rubicon model. The best outdoor toy a woman or man can buy, I think. 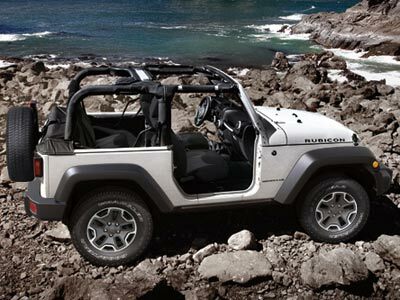 The Jeep is designed as a practical, working go-anywhere 4×4 rock hopping, trail conquering machine. Visibility is excellent. Controls are chunky, sturdy and easy to use. It is as mud proof as a comfortable. The interior is an excellent place for man and machine to become one. At the same time a mom with her kids will find it just dandy to go to the mall or on the morning school run. The modern Jeeps all have the normal safety equipment including airbags and a good sound system, air-conditioner and so on. For interior cleaning and water drainage, remove the floor drain plugs located just below the foot spaces. You can dismantle the black plastic type roof (without tools) either partially or completely remove it to make an open Jeep like you see in the old WWII movies. Just much bigger and better than the original. The Command-Trac 4WD system is unbeatable. 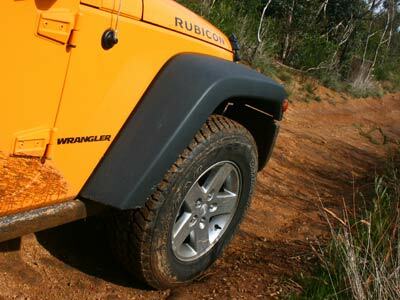 Rubicon has a 73.3:1 crawl ratio, allowing for a controlled 0.8km/h cruise up or down the rocks. The Wrangler is available with a V6 “Pentastar” petrol engine or a turbodiesel with your choice of automatic or manual gearbox. I would go for the automatic diesel. With the flip of a switch, Wrangler automatically disengages its electronic front sway bar when driving under 29km/h in 4WD 4LO mode for tremendous off-road articulation which I did not need on our 4×4 test trail. It is good to know you have it though. Front and rear Tru-Lok® electronic locking differentials lock power and distribute it evenly between the wheels for more traction. The instrument panel-mounted rocker switch can lock either the rear or both axles. A six-speed manual transmission comes standard on Sport and Rubicon. The Wrangler Electronic Throttle Control system’s special off-road calibration is designed to help the driver “feather in” the throttle over uneven terrain, logs and rocks. Wrangler’s hill descent control with grade sensing allows a smooth and controlled hill descent on rough or slippery terrain without the driver needing to touch the brake pedal. This system applies the brakes to each wheel individually when needed to reduce forward motion while negotiating down steep grades. Hill start assist helps when starting from a stop on a hill by maintaining the level of brake pressure applied for a short period after the driver’s foot is removed from the brake pedal. Wrangler’s Tyre Pressure Monitoring System regularly checks inflation levels for optimal safety, security, performance and fuel economy. If the levels are off, a warning light will illuminate on the instrument panel. The Wrangler deals with highways as easily as it does jeep tracks. Power steering and superb all round visibility makes parking a breeze. Electronic Roll Mitigation uses innovative motion sensors that determine when a rollover may occur and applies braking force to the correct wheel or wheels to reduce the likelihood of such an accident. Other accident avoidance features include: all-speed traction control with special calibrations for driving in 4WD 4LO; antilock brake system with a unique rough road detection system; brake assist system, which applies maximum braking power during panic braking; and multiple available four-wheel drive systems. The Rubicon3.6L V6 M6 (209kw and 347Nm) as tested is R416 910. 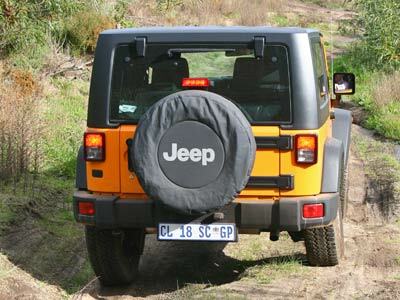 The diesel Sahara 2.8L CRD A5 (147 kW and 460Nm) is R440 910. The Long wheel base 4 door versions are about R22 000 more and may be the more practical options if you have a family. Warranty against defects and faulty workmanship for 3 years or 100 000 km. The A3 is a great little sporty car, with just a bit of extra flair, and style and oompf. It is a joy to drive, with one proviso. The tyres are a very low profile and the suspension is stiff. You will feel every ripple, pebble and bump in the road. If you are happy to “feel” the road all day and you want a classy smaller car then this could be the one for you. 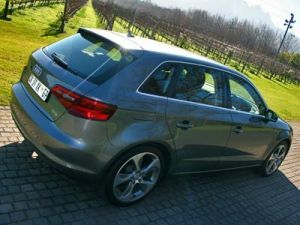 The Audi brand is still aspirational and this A3 will make many buyers very happy. Audi is very much the upmarket more sporty marque of VW. It shows and feels in every inch. The A3 exudes quality. Fit and finish is excellent. Materials appear to be top class. This car is at or near the pinnacle of small car engineering and design. Road holding and handling are above par. The A3 will go where you point it and stop pretty quickly when you ask her to. The actual ride is a little hard and bumpy. Build quality appears to be very good. The doors close with a satisfying clunk. The switches and controls feel right. The A3 is a driver’s car. It is fun to handle and does everything effortlessly. You will enjoy driving this car. It is poised and well balanced, almost to the point of perfection. The 1.8 mill produces 132kW at 5100 – 6200 and 250Nm between 1250 – 5000. Top speed is 232km/h and the 0 to 100km/h time is a very respectable 7.3 seconds. Audi claims a fuel consumption of 5.6 litres per 100km, but I think you will battle to get that figure. Bank on 6.5l/100km. Brakes, steering, acceleration, road feel – all come together just right. A great package. The interior is almost plain. Having said that, the attention to detail is superb. The cabin feels cosy, safe, smart and has an understated luxury about it. The model I drove came with all the goodies but bear in mind that quite a few essential accessories are optional extras on this car. This new A3 looks a bit like the previous model until you have the two together. It has changed quite considerably and for the better. It is an almost completely new car. The lines are really pleasing. I enjoyed driving the A3 but accept that many potential owners will be put off by the somewhat choppy ride. It is by no means as hard as a Golf GTi or any of the R range of Audis but tends to the stiffer side of suspension settings. Audi’s engineers have got it right with this gem of a little car. It does almost everything well. The A3 1.8 Fsi Stronic as tested is R 339 000, without extras. Leather seats are an extra R17 000. 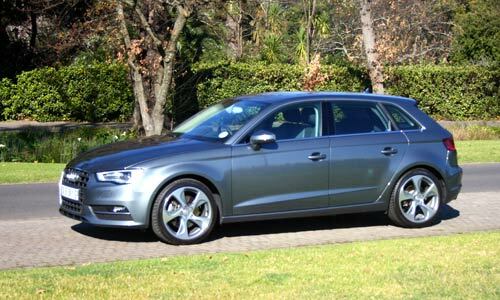 The Sportback range starts at R283 000 for the 1.2T FSI, and tops out with the 1.8T FSI quattro at R370 000. The best buy is the 1.4T FSI S tronic at R307 500.